If I Put a Spoon Under My Pillow, Will It Snow? My kids are desperate for snow. More specifically, they are desperate for a snow day. Apparently, so are their teachers. In early January, the tiniest picture of a snowflake appeared on my weather forecast. The details said wintry mix overnight, no accumulation, yada yada yada, blah blah blah. My kindergartner arrived home from school that day with specific instructions from her teachers. Place a spoon under your pillow. Wear your pajamas inside out. Flush an ice cube down the toilet. It was simple math to them. Do this + this +this + this = guaranteed snow day. This week, snow was again in the forecast. My Facebook filled with chatter and pictures of weather maps all foretelling the great snowstorm of 2015. It snow-dusted, just enough to turn the world a little white. Not enough to cover the grass even. Not enough to delay anything, much less close it down. I don’t mind really. I enjoy snow well enough, but only when it’s outside and I’m inside with a book and a cup of cocoa. But my kids mind. A lot. They are Virginia girls, desperate for at least a few sizable snowfalls a season. Every single time there is a whisper of a snowflake or two falling in the night, our town is abuzz, the Wal-Mart shelves clear out of milk and bread, and my children brace themselves for a real and true snow day. “This is it.” That’s what they think. Maybe Joseph felt the same way. All those years, he waited and waited, holding on perhaps to a distant memory of those visions from God of his family bowing down to him. He waited in a pit while his brothers plotted his death, and then settled for selling him into slavery. He waited as an Egyptian slave, working faithfully and with integrity for his master. He waited when he was falsely accused and thrown into an Egyptian jail. Then the cupbearer forgot about Joseph for another two years. Waiting is hard enough. But getting your hopes up and then discovering disappointment, is even harder. Joseph could have given up. Maybe he did. Years later, though, that cupbearer finally did remember Joseph. And, perhaps when Joseph least expected it, God came through. In God’s perfect timing. In God’s perfect way. God came through. Had the cupbearer remembered Joseph years before like he had promised, Joseph might have made it out of prison. Maybe. Perhaps. We’re not really sure. Pharaoh could have just dismissed the cupbearer’s story as little more than a novelty. But in this precise moment, the Pharaoh needed someone to interpret his dream, and Joseph was the one to do it. Interpreting that cupbearer’s dream had seemed like a wasted opportunity, yet years later that is what God used to rescue Joseph from prison. What we do today might not seem to matter, but God doesn’t waste our faithfulness. His timing is precise and perfect, even when it doesn’t feel like it in the moment, even when disappointment presses in, and even when the waiting feels like it can collapse your heart. We can’t place our hope in circumstances or people like a forgetful cupbearer. We can’t always decipher God’s plans and predict when “this” really is it. We can’t make it snow despite all of our snow dances and inside-out-pajamas. We can, however, live God-glorifying lives day-in and day-out, being faithful even to the most mundane tasks that earn us no worldly recognition or honor. Our hope, after all, isn’t in circumstances or people or ‘connections’ or our own abilities. They will take us on an endless emotional roller-coaster of misplaced expectations and inevitable disappointment. Our hope, though, can be rock solid, unshakeable and steadfast when we place it in Him and Him alone. 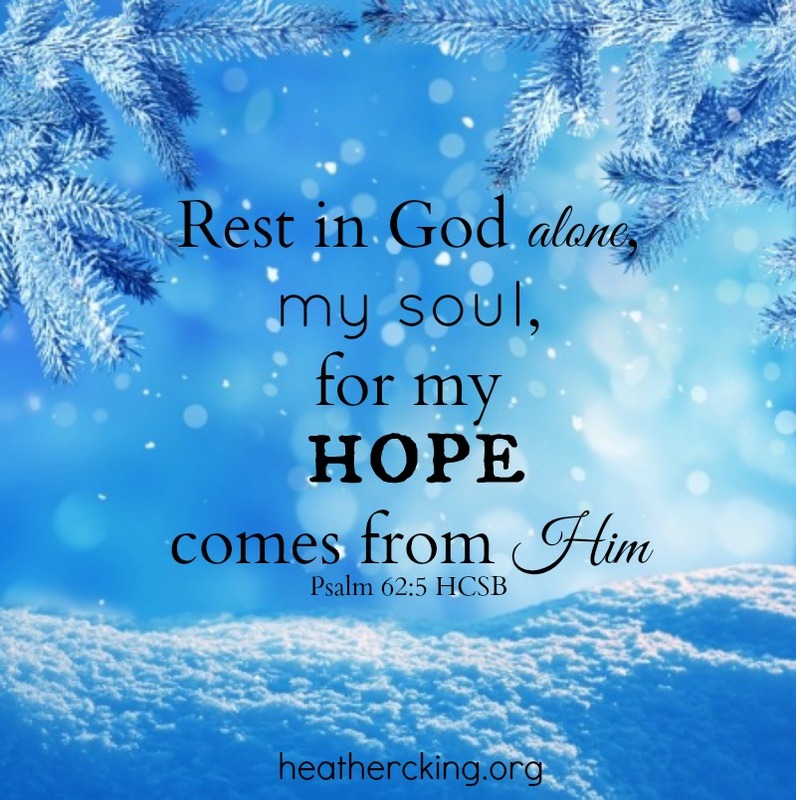 “Rest in God alone, my soul, for my hope comes from Him” (Psalm 62:5 HCSB). Why won’t anyone sit in the back of the minivan?